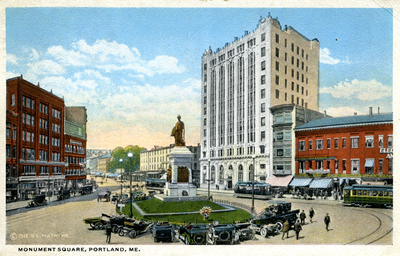 General view of Monument Square, from northeast, in 1916. Soldiers and Sailors Memorial, and Fidelity Trust (Bank of Commerce) building, 465 Congress Street, at center. Trolley cars at right. "Monument Square, Portland, Me." (1916). Portland Postcards. 17.